The hammerhead shark stares at the figure next to it, a woman holding a camera and wearing a black wetsuit and SCUBA gear from head to toe. The woman is Gaelin Rosenwaks. Her eyes are hidden behind a diving mask, but she seems to be looking back at the hammerhead. It’s almost as if they know each other. She’s the “Fish Lady,” after all, and this water is as much her home as her apartment building in New York City. 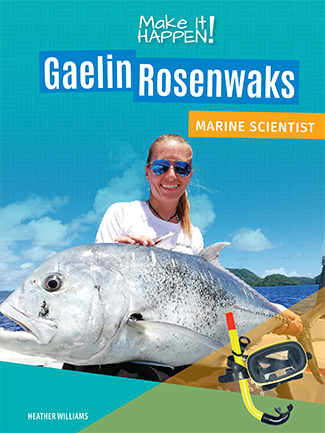 For Gaelin, the ocean is everything. Water has been her life for as long as she can remember. Now, she makes a living studying it, protecting it, and advocating for it. Available in 2019, pre-order today!